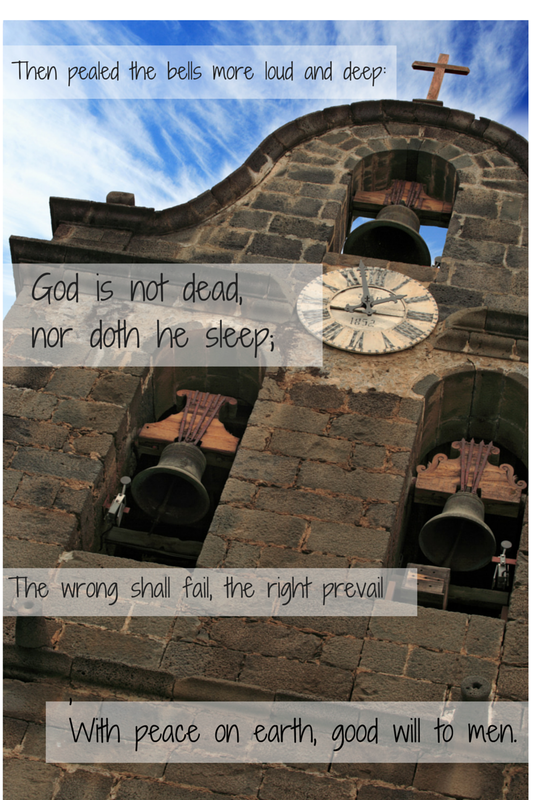 Will YOU hear the bells on Christmas Day? Henry Wadsworth Longfellow heard the bells on that Christmas Day, 1864. He wrote these words while the Civil War raged with wave after wave of violence across our nation. Few of us, perhaps none of us can grasp the magnitude of human suffering of such a time. He wrote these words in spite of the notice, the opened letter, that would surely have been laying somewhere near him—the one informing him that his son was presumed dead in the war. He wrote these words while grieving alone—no wife to share these emotions or to comfort—because she had died just one month before, in November. He wrote these words with absolute confidence they represented an accurate description of what was going on. His knowledge compelled him to compose these verses in the midst of his overwhelming sense of pain and loss. This is part of the miracle of Christmas. You see, the birth of Christ brings the world eyes to see, ears to hear, and minds to understand things beyond appearances, beyond what the senses or the unredeemed intellect could fathom. Despite the chaos or any hardship we may currently bear, if we have ears to hear, we too can hear the bells on Christmas day. WIll YOU hear the bells?